1. Preheat the oven to 220˚C, gas mark 7. Toss the squash and red onion with 1 tbsp oil and spread over a parchment- lined baking tray. Season and roast for 20 minutes. Meanwhile, make the dressing by mixing the remaining 2 tbsp oil, lemon juice, garlic, honey and red chilli; season and set aside. 2. Turn the oven down to 180˚C, gas mark 4. Strip the cavolo nero leaves from the stalks (save the stalks for soups or smoothies) and tear into 6-7cm pieces. Combine with the squash in the roasting tray and roast for 5 minutes. Next, stir in the freekeh and roast for another 5 minutes. 3. Meanwhile, heat a large frying pan over a high heat. Cut the halloumi into 12 slices and fry for 1-2 minutes on each side until golden (you may need to do this in batches). Transfer the squash, cavolo nero and freekeh mixture to a large serving plate. 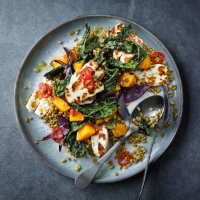 Arrange the hot halloumi on top and spoon over the dressing.